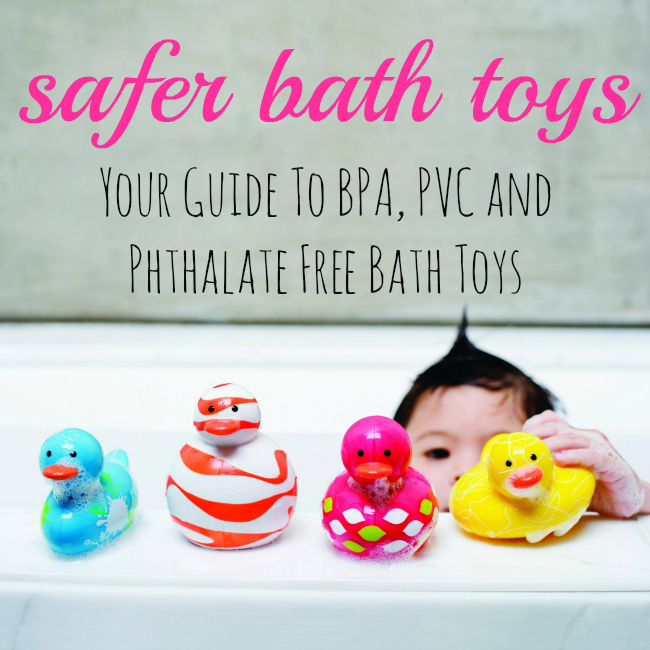 While I’m no expert, I do avoid PVC, phthalate and BPA when I purchase bath toys for my own children or as gifts for others. Over four years ago, I had a hard time finding such products so I researched and published one of my most popular posts on safe bath toys. I still get emails asking whether a specific bath toy is considered safe and sadly, I find a lot of bath toys still do not meet this criteria. I’ve finally updated our list of safer bath toys so we can all shop smarter, enjoy. B.Toys (Battat) – All of their toys are both BPA free and phthalate free. The squishy toys do have non-phthalate PVC in them, they are softened with a food-safe citroflex. Green Sprouts – The Stacking Cups are PVC free, phthalate free and BPA free. Green Toys – Another of my favorite brands because everything is created with recycled milk jugs. The submarine, tugboat, ferry boat and sea plane are PVC, phthalate and BPA free and also get great Amazon reviews. Hevea – Their toys are made from natural rubber which is free of BPA, PVC and phthalates. Their toys are also biodegradable. Milliwik – These clever bath-friendly playing cards are BPA, PVC and phthalate free. Super fun. Moluk – Created by Swiss designers, the Plui is a rain cloud that fills with water, sprinkles over your child and then opens to be cleaned out (no mold!). I also really like the Mini Bilibos because they are so versatile. Perfect for stacking, floating, scooping and digging. Munchkin – The only product from Munchkin that meets the test is the Caterpillar Spiller. Rich Frogs – Their bath toys are BPA free, phthalates free and use phthalate-free PVC. I particularly like their terry towel mitts and tub puppets. 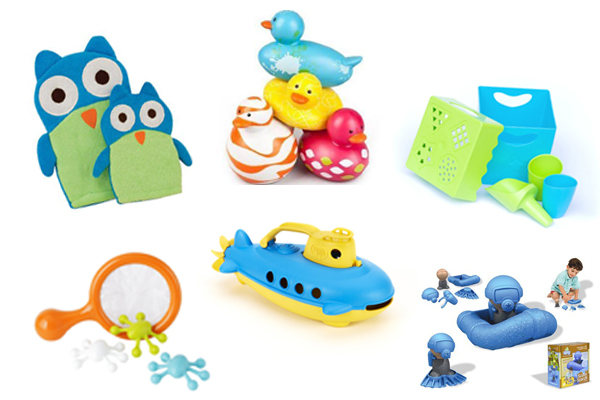 Sassy – All bath toys are BPA, PVC and phthalate free except the Snap & Squirt Sea Creatures and they are non-phthalate PVC. Skip Hop – The only bath toy that meets all 3 conditions are the Stacking Toys. Their other bath toys are phthalate free and BPA free but not PVC free. Sprig – All toys are made from recycled materials and do not contain BPA, PVC or phthalates. Zoe b Organic – This biodegradable and made in the USA bath and beach toy set is one of my favorites. Also free of BPA, PVC and phthalates. For more water toys and safer toys for sand play, check out our Guide to Safer Water and Sand Toys. Does anyone know if the baby king bath toys contain PVC, BPA and/or phthalate? I noticed you have Nuby on your list of safe bath toys. I also thought the same thing and just bought a purple octopus bath toy for my son only to find printed on the bottom of the toy that it is recycled plastic #3 and has the letters PVC written. Very disappointed as Nuby touted their products as safe when they are actually not. Hi! I just checked into Boon toys, excited to find bath toys that do not have PVC- however their suction cups on the toys you listed are PVC and contain phlathlates. Thanks for the tip Meagan, I updated the post!